Member & Past President Carson Smith will lead us on a virtual tour of the Indianapolis Scottish Rite Cathedral, which has been described as one of the finest examples of Neo-Gothic architecture in the United States. In a 1996 poll, the Indianapolis Business Journal found the Cathedral to be the most popular historic building in the city. 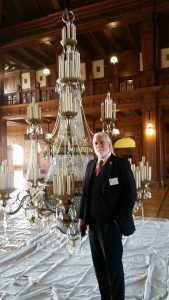 Carson leads regular tours of this historic building located in downtown Indianapolis, so this virtual tour may whet your appetite to see it in person. As always, the meetings provide an opportunity to visit with your fellow Scots and find out more information about our upcoming events. First time guests are not asked to pay and shouldn’t feel obligated to bring a dish.